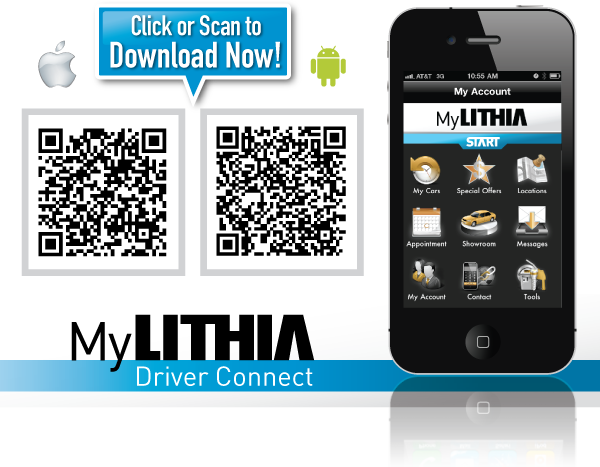 Introducing the MyLithia app, the mobile app solution to all your daily car care needs. We believe that our free app, developed by Lithia Labs in a partnership with DMEAutomotive, is one of the best automotive apps on the market, with exciting features, such as a flashlight, parking finder, and a gas price tool. You can also use our car app to browse local dealership showrooms, value your vehicle for trade in, or calculate the monthly car payment on your next purchase. Want more? Schedule a service appointment on your smart phone and never worry about long lines again. You can even find your car with our Car Locator feature! As you can see, the MyLithia app is a wonderful car app with wide range of utility for you to use on the go or at a Lithia Auto Stores location near you. Download it today using the link above or search the iTunes of Android app stores.